Welcome to the Gamma Psi Chapter of Gamma Phi Beta! Gamma Phi Beta is founded upon four values that continuously guide and shape our house: Love, Labor, Learning, and Loyalty. LOVE: Our college experience will be full of the best of times and the worst of times. Whether it is by helping each other through the rough or celebrating the good, Gamma Phi Betas love their sisters! Sisterhood comes first and foremost. Through our many social events, house retreats, and simply hanging out with each other, we strive to cement a foundation of trust and friendship. LABOR: We are only as strong as our weakest link. We realize that building an excellent house requires much work. We constantly labor to ensure every sister is happy, and that we are a strong chapter inside and out. Whether it’s putting together one of our amazing social events, getting ready for the best recruitment ever, or merely helping a sister out, we are committed to the excellence of Gamma Phi Beta. LEARNING: We always remain rooted to our primary mission here at UNI--to learn; and Gamma Phi Beta supports that learning. Gamma Phis are committed to academic excellence and leadership within the campus community. 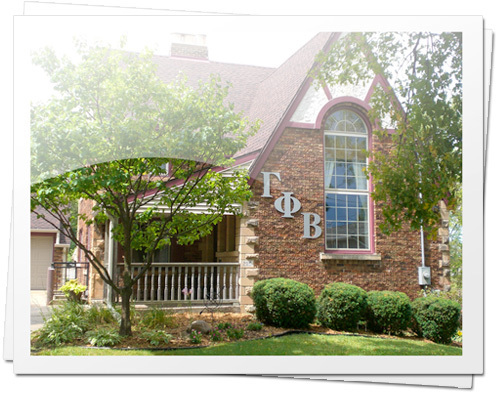 It is difficult to go any place on campus that hasn’t been touched and influenced by a member of Gamma Phi Beta! We recognize, too, that college is a place to learn life lessons. We strive to help our sisters and allow them to help us as we learn life lessons in college. No matter what, you will always have a sister to learn from and lean on. LOYALTY: We are sisters until the end. We realize that Gamma Phi is a life long commitment and have grown to love our house with all of our hearts. We come from every corner of the country, but have all come to be loyal to Gamma Phi as our home away from home, our shelter in storm, and house full of best friends. We cannot wait to show you our sisterhood!